"...How many people can realize that behind each number lies innumerable pain, behind each number lies a tragedy without catharsis?..." «The aim of the Institute is not only to arouse public awareness and sensitivity but to bring pressure to bear both in the private and public sectors so that our country will at last cease to have the lamentable privilege of holding the record for the greatest number of deaths from road accidents in Europe, of which, according to statistics, most victims are young people». This statement was issued by the President of the Board of Directors of the Institute on the occasion of her inauguration. This initiative and endeavour, which began as a result of a tragic event, we hope will become a medium for improving the conditions that prevail in Greece by the adoption of and adherence to measures and policies on matters of road culture, road safety and the prevention of traffic accidents in our country. 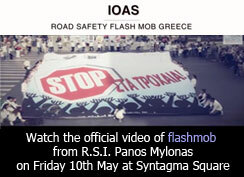 Secretary General of Public Order and President of RSI ‘Panos Mylonas’ announce joint actions and initiatives for the prevention of road traffic crashes.